Collecting missing or outdated client data is difficult unless the data drives new sales opportunities. RightBRIDGE® is built on a flexible data hierarchy that prompts producers when analyzing outdated or missing client profile information. The most important data is collected first, maximizing additional new sales opportunities. When missing or outdated client data is identified, RightBRIDGE® will gather the necessary data and provide the updated data back to the company’s central data store for use in other systems. 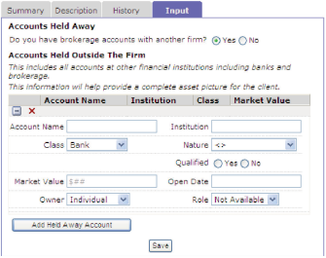 Each client profile contains a Profile Completeness indicator to inform the financial professional of the system’s depth of knowledge about the client, prompting them to add additional (or verify potentially outdated) information. With a single click, producers are prompted with a dynamic and intuitive form that prompts them to enter the most relevant data. As additional data is gathered, RightBRIDGE® will process business rules in real-time, providing the financial professional with an updated set of relevant sales opportunities. The better the client data, the better the quality of relevant sales opportunities for each client. As financial professionals gather the most relevant data, RightBRIDGE® instantly re-calculates and presents a revised set of relevant sales opportunities.